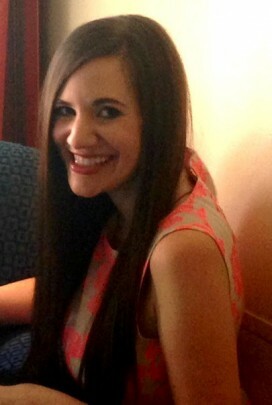 If you follow me on Instagram, you may have noticed that my hair has gotten long- like real long. My hair has always grown fast, but after my hair cut last year, I decided that I wanted to grow it out. Well fast forward to now and my hair falls all the way down my back. I’ve had it long for the summer which has been both fun and incredibly convenient as for me as I think long hair is the easiest to style, but a cut is in my future. I’m going to donate it to Pantene and a whole post about that will be on the blog after the big chop happens. But for those of you who are wanting to help your hair grow long, or just keep it extra healthy at the length it’s at, I’ve put together some essentials for keeping my hair healthy and looking good! I’ve always been a faithful user of a good conditioner, but it wasn’t until recently that I started deep conditioning my hair. This is great for any length of hair as it helps make it stronger and healthier but is especially essential for long hair, color-treated, or damaged hair which tends to get dry. 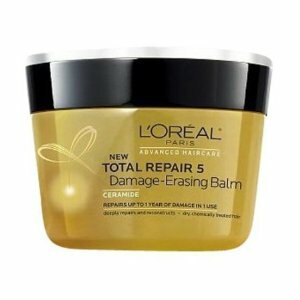 I’ve tried a few on the market and my favorite is the L’Oreal Total Repair 5 Damage-Erasing Balm. This treatment does it all as it repairs split ends, weakness, roughness, dullness and dehydration. It claims to reverse a year’s worth in damage in one wash, which I think is a slightly lofty claim, but it really does work. Since I was a little girl I’ve had hair that was pretty tangled when I got out of the shower, no matter what types of conditioner I used. I remember my mom would spray detangler in my hair and take a long comb to get it under control. So as my hair got longer, I realized that I needed to do something about these tangles! I went to Walgreens and CVS and in the aisles of beauty hair care products, there wasn’t a single detangler on the market! (However, there are now BB Creams for your hair…) I finally checked the baby aisle and found a detangler there, but was convinced that I couldn’t be the only adult dealing with tangles. 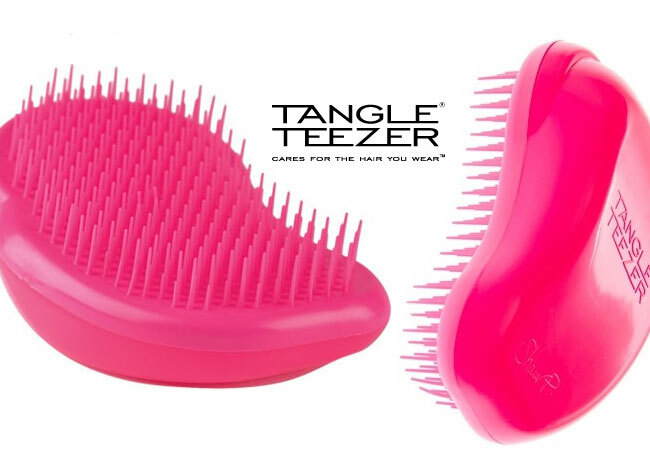 Enter the Tangle Teezer. Oh my goodness. Essentially it’s a hard brush with firm rubber bristles that somehow slides through your hair when it’s wet, no detangler needed. AKA it’s a game changer! If you have curly hair, this is an absolute must too as it glides through just as easily when hair is dry and somehow doesn’t get caught, meaning no more falling out, breaking hair! I remember seeing a commercial for the hair turban years ago and my mom and I laughing at it. We thought who would need such a product and the commercial specifically cited that you could “answer the phone” while you had it on as a plus. Well years later, I’m a convert. Basically, long hair takes a while to dry when you aren’t using heat products and leaving it wet down your back is rather uncomfortable. 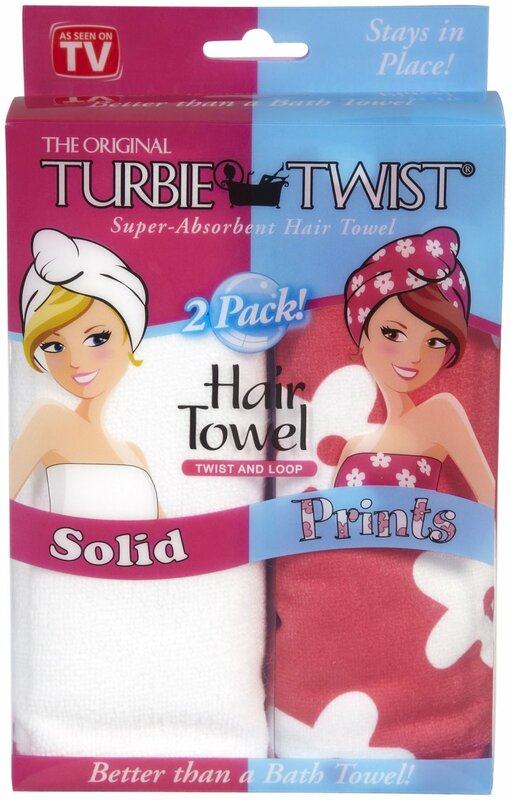 So after I’ve detangled my hair with my Tangle Teezer, I put my hair up in the Turbie Twist. Now, essentially, this is just like a small towel, except it really is great that your hair stays put while you are moving around and yes, maybe even answering the phone. As my hair turns curly, I leave it in there for about 20 minutes to get most of the water out, brush with the Tangle Teezer again, and then put it in a braid to dry the rest of the way. Make-up free selfie (though I did add a filter- guilty) rocking my turban! 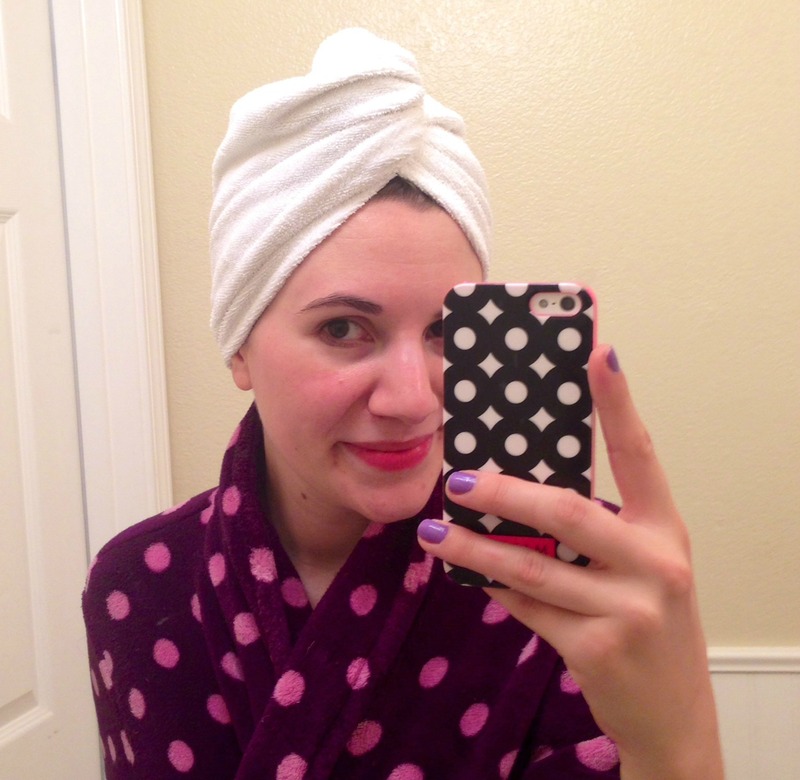 After you’ve taken your hair out of your glamorous hair tuban, I like to apply a treatment. 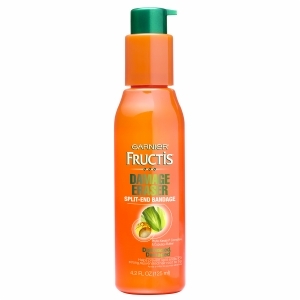 From the drugstore, I like Garnier’s Damage Eraser Split End Bandage which strengthens hair and increases your damage resistance. Just use one pump and apply it to the ends of hair, combing through after with your Tangle Teezer. If split ends aren’t an issue (lucky you!) but you still want to give your hair a little love, go for Aveda’s Smooth Infusion which makes your hair smoother and silkier! Both of these products are great and won’t weigh down your hair, while making it softer and stronger. This one is huge as I’ve always abused my hair when it comes to heat products. Having naturally curly hair, I have been drying it straight and straightening it since 7th grade. While I may like the look, my hair doesn’t like the heat, causing split ends so over the past year, I’ve kept my hair dryer in the drawer. I always thought that my hair would never get that sleek look unless it was blow dried first, but I’ve found that with some special steps, the same look can be achieved. Which means that not only is my hair not getting that 20+ minute blast of heat, but my arm is a lot less sore too! Although I do occasionally wear my hair wavy, I straighten it pretty frequently these days and have found that using a good heat protector spray is essential. I used to stay away from heat protectors as so many of them would make my hair wet (not what you want after spending so much time drying it) or make it crispy which no one wants. But I’ve found the solution to all that- the dry heat protect spray! Oscar Blandi is one of my favorite brands for dry shampoo and their Pronto Dry Heat Protect Spray is amazing and protects hair from up to 450degree heat! 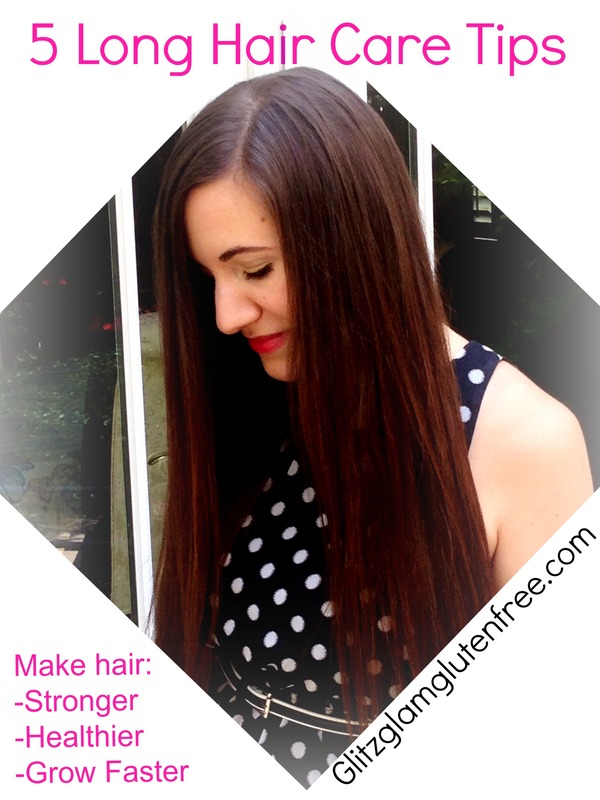 -What’s your secret to keeping your hair looking good? Love these tips! I especially like the tangle teezer idea; I just sent the link to my dad so he can buy it for my 9 year old sister who absolutely HATES having her hair brushed. Let’s hope it works for her! In the summer I usually let my hair air dry completely, but now that it’s getting chillier outside I’ll probably have to start blow drying it again so it doesn’t freeze when I walk out the door in the morning. That means I’ll have to start waking up a little earlier too. Ugh! Love your tips. Mine are that I rarely brush my hair, I always let my conditioner “set” while I continue my shower and don’t rinse until last minute and I rarely dry my hair.